Brittney Wells is entering into her second season with Moonglow. She has had a passion for music since she was a child. Her love of singing and performing brought her all the way to Berklee College of Music in 2008, where she studied songwriting and vocal performance. She has frequented many of the best venues in Boston and NYC, most notably the Berklee Performance Center, being featured performing many different musical styles. After having spent two years writing and playing professionally in Chicago, Brittney has returned to Boston, and can be seen with Moonglow this summer and beyond! "Matthew Condon has been singing with Moonglow for 2 years now, bringing energy and entertainment to everything he does. 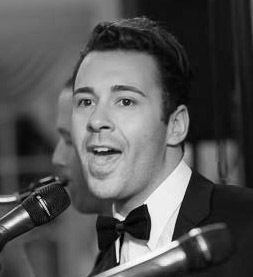 Matthew has lived life through music, starting at an early age performing all over the East Coast, and culminating in a Bachelors Degree in Vocal Performance from New England Conservatory. Writing, composing, and performing - Matt does it all... and always with a smile on his face. The energy Matt brings to the bandstand is contagious. Just try to stay off the dance floor! Michael was a founding member of two of Boston's most sought-after function bands before forming MOONGLOW. With a musical career spanning decades, he is a well-known and well-respected member of the Greater Boston musical community. His bass playing and strong vocal ability are always in demand. In addition to his years of live performance experience, Michael has sung on numerous radio and television ads in the Boston market. Daniel has performed in many bands in and around the Boston area, including Boston Award Winners Batwel Rada, Hommuculus, Shockra, Hip Pocket Orchestra, and Hot House. He has also perfomred with Senegalese Master Percussionist Ibrahima Camara, winner of a Boston Music Award for Best World Music Act. We're happy to be able to call Chris, whose professional career stretches back 20 years, a member of Moonglow. He has fit right in, playing our current songlist mixed with hits from all decades. In addition, his powerful vocals bring the total of Lead Vocalists in the band to FIVE! His . He has performed at over 3000 events with another well-known Boston band, the Johnson Brothers. He continues to work with these groups today. Brian studied violin in grade school, then took Scottish snare drum lessons with the Colonial Pipers bagpipe band during high school. In 1987 he began studies in drum set performance at Berklee College of Music where he earned a Bachelor's degree. Brian has performed in a wide variety of settings and across many genres of music. From classical performances with concert pianist Elliot Finkel to Reggae concerts with the LA Rockers to Jazz concerts with guitarist Mike DiBari and Rock with The Naturals.